Have An Offline Business You Want To Put Online? To learn anything we all go through a process! All new knowledge learned is always built on previous knowledge. THIS is how we all integrate new concepts. If you're determined to build a successful E-business then you're going to have to learn some new skills. This is the fact! In these Directories we only focus on the key, critical understandings necessary to operate a profitable Internet business. Understand these concepts and you too can run a successful web business. Now, as we don't know you personally only you can decide where you currently 'reside' on this Knowledge ladder of Internet Success. And... only you can take the necessary steps to achieve your goals! These Resources Directories are just meant to be guides for your quest. We've just walked ahead of you, is all. THEN... *Register Your Interest* by clicking on the link at the end of each section. The key information will be sent to you immediately. 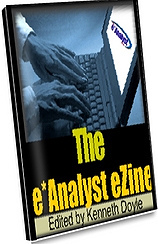 Important new information will be published in The e*Analyst ezine. OR... Tell us what you want to know. Click on the graphic link, fill in the survey... and we'll give you a valuable ebook - *The Getting Started Action Guide* - for your participation in our ongoing survey. 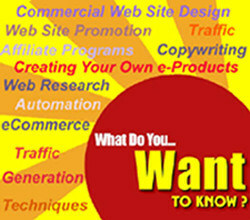 The web is an interlocking 'web' of ideas, sites, links and AFFILIATE programs. AND... there are just so many ideas, possibilities. HOW do you set up your own AFFILIATE program? All these topics are covered here. You've got your site up and running. It hums like a finely tuned machine. AND... you're working more now than you ever did before in your J.O.B. You forgot to automate it. Automation is truly the wonder of the web. It allows one person to do the work of many. So, if you want to work on your tan more often... Automate It! NOBODY is the source of all knowledge! In this Directory section you'll find Interviews with net personalities, and Articles by web specialists. These Interviews and Articles are updated regularly. The PREMIUM resources on all aspects of the E*Knowledge Steps can be found within the 4 FYHM Directories. It is recommended that you seek out this expertise first... because any resource recommended in the directories is tried, tested and true. However, in the spirit of sharing, this links directory is provided for visitors. It is regularly updated and expanded. -------->> T E S T I M O N I A L <<-------- I've just received another issue of your ezine and wanted to say that I really like the way you focus on a particular subject, and then feature a resource as an easy way to accomplish a particular technique that you've previously mentioned (I hope that makes sense?) ... and all without lots of hype in the way.